By all accounts, the Russian President Vladimir Putin’s visit to Tehran last Monday was a carefully choreographed piece of politico-diplomatic ballet to serve three precise objectives. The first of these was to show that Russia recognizes the “Supreme Guide” Ali Khamenei as the ultimate decision-maker in the Islamic Republic. Western leaders often blame Iran’s “unelected officials”, meaning the “Supreme Guide”, for the Islamic Republic’s adventurism on the international stage. They delude themselves by thinking they could obtain better deals from “elected officials”, meaning the President of the Islamic Republic. Based on that analysis, Western leaders, notably successive US presidents tried to strike deals with a string of men who served as president in the Khomeinist regime- from the hapless Abol-Hassan Banisadr to the enigmatic Mahmoud Ahmadinejad and passing by the crafty Hashemi Rafsanjani. Their current hopes are pinned on President Hassan Rouhani, a protégé of Rafsanjani. The Western analysis is wrong because of two reasons at least. The first is that the words elected and un-elected don’t mean the same thing in the Islamic Republic as they do in Western democracies. This is because only those authorized by the regime are allowed to be candidates. Even then, the pre-selected candidates of the regime cannot hope to win unless their “victory” is endorsed by a 12-man body of mullahs. Thus to suggest that Rouhani is the “elected” president of Iran requires a certain sense of humor. (Rouhani’s patron, Rafsanjani, was not allowed to even become a candidate last time!) At the same time, Khamenei can claim to be as much “elected” as Rouhani or anyone else in the Khomeinist system. This is because the “Supreme Guide” is elected by the Assembly of Experts, which itself is elected by the people in the same fraudulent way that the president is elected. Thus, in the Islamic Republic all top officials are elected; only the elections are not genuine. As a veteran of the Soviet system, Putin understands that perfectly. Leonid Brezhnev, too, was elected in the same way as Josef Stalin had been and Khamenei is today. With the Soviet Union having turned to dust long ago, Putin has rebranded himself as a Russian nationalist. In that capacity, too, Putin understands the nature of despotic systems in which authority is always personal, never institutional. In the Russian system the ruler, or tsar, also claims special religious attributes just as the “Supreme Guide” does in the Khomeinist system. One of the tsar’s titles was “gozudar” which means “Lord of the World”, drawing the potentate close to a claim of divinity. The founder of Russia as a nation-state, Ivan the Awe-Inspiring, or “Terrible” as Western literature likes to dub him, located his court in an Orthodox monastery for years. He claimed “divine authority” when he ordered the chopping off of the heads of nine Tatar Muslim chieftains in 1550. Western commentators often describe the Russian system as “absolutist”. However, the term despotic may be more apt. In that system, a tsar that does not govern well is not criticized for being inefficient or unjust; he is branded as “impostor”. The subtext is that a “true tsar” always governs well and is thus above criticism by the lesser mortals. The real “tsar” cannot lose a war, be constantly drunk or even go mad. If he does any of those things he is an impostor, not a bad tsar. Russian history is full of adventurers claiming to be “true tsars” when things went badly under the reining despot. Like Shiite Iran, Russia developed a tradition of martyr-worship in which secret sects such as Radenyie (zealots) and Khlystii (flagellants) inflicted corporal punishment on themselves in atonement for the guilt of fathers who failed to defend the “true tsar”. Unlike leaders of Western democracies, Putin has no difficulty understanding the Khomeinist system. This is why he went out of his way to pay respect to Khamenei. To start with he agreed to ride in a bullet-proof Mercedes sent for him by Khamenei to the airport (Putin had brought his own bullet-proof Zyl, but didn’t use it). He drove directly to Khamenei’s palace, ignoring the welcoming ceremony prepared by the rudderless Rouhani. The Russian spent almost eight hours in Tehran of which one and a half was devoted to the “Supreme Guide”. Again, contrary to protocol, Putin brought a gift for Khamenei, a 300-year old copy of the Koran. (Gifts are exchanged by heads of states only on state visits; this was not one of them). The Russian showered praise on Khamenei and made it clear it was only with him that Moscow would deal with on all key issues of international and bilateral relations. That Khamenei was seduced by Putin’s show is clear from a long editorial in Kayhan, the daily that reflects the views of the “Supreme Guide”. “Putin’s intelligent move has provoked wonder and consternation in European and American circles” it said. By paying homage to Khamenei, the Russian leader wanted to show that an alliance with the Islamic Republic was a top priority of Russia’s new global strategy. Kayhan also increased the length of the meeting by half an hour, from 90 minutes to two hours, to heighten its importance! 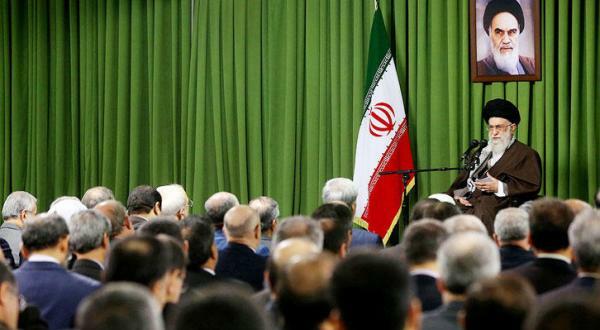 It was obvious that Putin’s decision to put all his chips on Khamenei had disturbed the rival faction led by former President Hashemi Rafsanjani, with President Hassan Rouhani as its current public face. Rouhani’s spokesman Baqer Nobakht telephoned the Tehran media to inform them that during a visit to Moscow, Rouhani, too, had received a “special gift” from Putin. The trouble was that Putin’s “gift” to Rouhani turned out to be a 17th century Persian shield captured by the Russians in one of their numerous wars against Iran. Putin’s second objective was to throw a monkey wrench in what he thinks is the American game-plan for Iran over the next five years. In a few hours, Putin virtually destroyed President Barack Obama’s hope that the supposedly pro-American faction, led by Rafsanjani with Rouhani as its current field-man, might marginalize Khamenei and lead Iran in a different direction. Finally, Putin wanted to send a message to others in the region and beyond that while alliance with the United States, a fickle friend, leads only to disappointment and grief, cultivating Russian friendship is a wiser strategy. On the surface, Putin achieved all three objectives in Tehran. However, only time will show whether those objectives were even worth reaching for.